Info below is from a NJ Conservation Foundation email just received. The state assembly has resisted supporting open space funding, and needs to hear from supporters. The vote is this Thursday, July 31. Last chance to bring open space funding over the finish line! Tomorrow, July 31, is the last chance for the New Jersey Assembly to pass legislation to replenish open space, parks, farmland and historic preservation funding this year. Please help ensure the measure is approved before it's too late! Please call and email your Assembly representatives today! Urge them to attend the Assembly session tomorrow and support ACR130. Funds from the last bond referendum in 2009 are all spent or allocated. Without passage by the Assembly tomorrow, the measure won't make it onto the November ballot. This link may allow you to send an email. ACR130 would dedicate 4% of existing Corporate Business Tax revenues to critical open space preservation and environmental protection programs through Fiscal Year 2019, and dedicate an additional 2% of existing CBT revenues from FY2020 going forward. This would provide a long-term, dedicated source of funding for land, water and farmland protection efforts without any fiscal impact until FY2020, when an additional 2% of CBT revenues (approximately $50 million) would be allocated for these purposes. All Green Acres, Blue Acres, Farmland and Historic Preservation funds from the 2009 $400 million bond act are now fully allocated. Without action, these critical efforts will come to a standstill while tens of thousands of acres of natural lands and farmland are in need of protection. The New Jersey Senate has already passed this legislation by a landslide vote. This legislation provides a long-term, dedicated source of funding for park and preservation efforts without any fiscal impact until FY2020. Preserving open space and farmland is critical to the future of our state's quality of life and economy. Thank you in advance for your help! Please forward this email to others who may be interested in helping, and share on your social networks. If the plaque commemorating those who died in the Battle of Princeton got overgrown by vines, people would understandably be upset. But how about botanical tributes at the Battlefield? Mercer Oak The Second is doing well, carefully protected by fencing and no doubt periodically checked for health. But there are other trees planted in memory of the battle that have been abandoned to whatever fate may come their way. Not far from the Ionic Colonade pillars are flowering dogwoods that were planted all along the perimeter of the north field. Those to the right of the pillars are doing fine. Those on the left are being smothered by vines--mostly porcelain berry and wild grape. Some are so badly blanketed that you can't tell a dogwood is there until you peak under the mass of vines and see the venerable trunk of the dogwood holding up the free-loading foliage. In this photo, porcelain berry leaves are on top, grabbing the sunlight from the flowering dogwood leaves below. I liberated a few of the dogwoods from the smothering vines some years back, but they really won't be saved until their protection becomes hard-wired into the Battlefield's maintenance. Here, again, the focus on lawn mowing to the exclusion of all other aspects of grounds maintenance has allowed an attractive and meaningful planting to be badly neglected. It's really very simple for a crew to go in, cut the vines at the ground, maybe spray a dab of 20% glyphosate on the cut stem, and preserve these historically important plantings. It might add a couple hours a year of maintenance time. The dogwoods also provide nutritious berries well timed with fall migrations, that is, if they get enough sunlight to power the production of the berries. 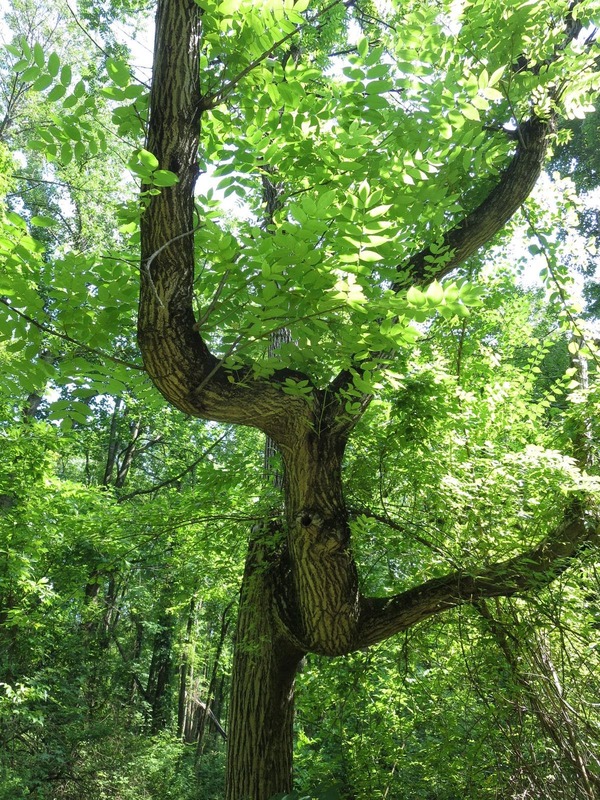 but I was recently told by Bill Sachs that the canker on its trunk--caused by the chestnut blight that nearly wiped out chestnuts a century ago--is not healing, suggesting that the tree will eventually succumb. 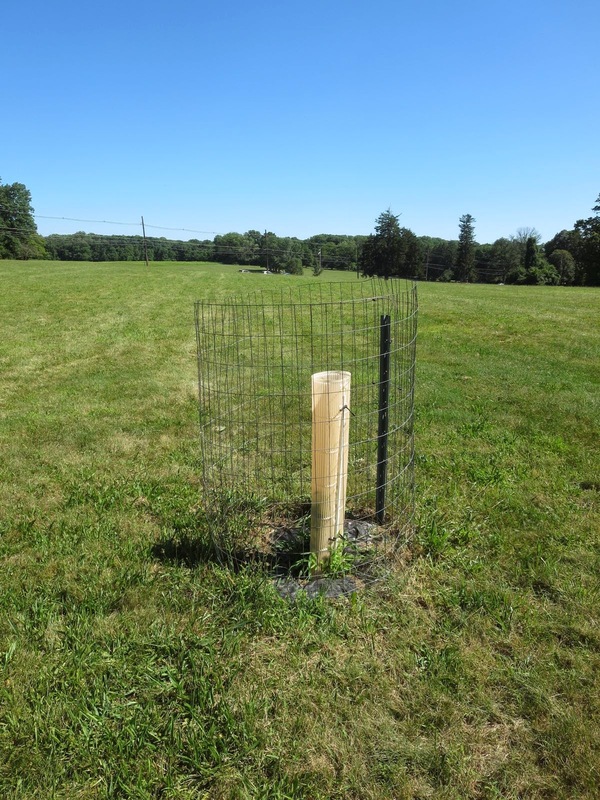 Though this particular tree came out of a breeding program meant to generate blight-resistant native chestnuts, only about half of the trees will actually show resistance. Of the four chestnuts planted at the battlefield, two have succumbed, and this one may as well. and Bill has already planted two replacements for the ones that died. A larger question is whether the Battlefield wants to look anything like it did at the time of the battle. There were no lawnmowers back then, unless you count livestock, and these turfgrasses are not native to America. It's great to have a nice surface to walk on, have picnics, fly a kite, re-enact. 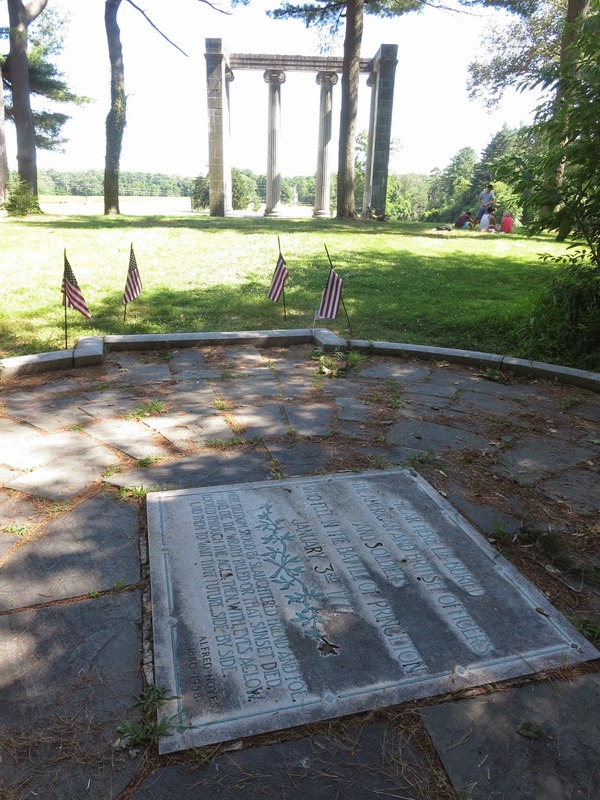 Keep some turf, but should the landscaping really have nothing to do with historic accuracy? Many battlefields around the country have made an effort to restore their landscapes to better reflect the era in which a battle took place. Mowing is very time-intensive, and most of the turf here is never walked on. The open feel is nice, but that could be maintained by reducing somewhat the mowed expanse, and restoring native grassland in unused areas, with broad trails through them kept mowed so that people can have the experience of walking through an authentic 18th century meadow. An orchard, too, would add some authenticity. But again, this means that an institution must go beyond lawnmowing in its conception of what constitutes caring for a landscape. Begin, at least, with the dogwoods. 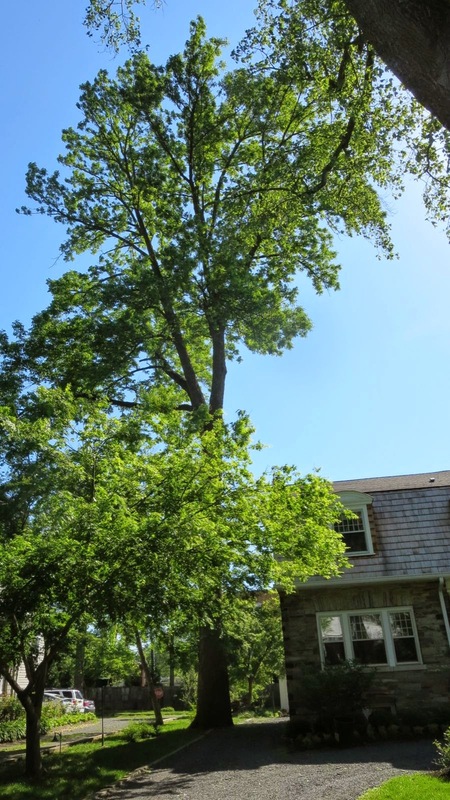 This is a towering white ash tree, one of thousands in Princeton, and for as long as anyone can remember, it has grown "real good for free", as Joni Mitchell might say. As with the clarinet player in her song, playing for free on a street corner, people pass it by without a thought, while it quietly supplies beauty and abundant ecological services--shade, cooling, habitat, oxygen, carbon sequestration--all rendered at no cost. "In Princeton, we will over the next decade likely witness a dieoff approaching the scale of the chestnut and elm dieoffs of the 20th century, as the emerald ash borer, which hitch-hiked to Michigan from Asia in wooden packing crates, continues its spread eastward." It doesn't take any great clairvoyance on my part to see the future. I had once lived in Ann Arbor, MI, which had to cut down 10,000 ash trees at a cost of $5.8 million. This spring, the emerald ash borer, known unaffectionately by its acronym, EAB, was finally found in NJ, 25 miles north of Princeton, in a parking lot next to Patriot Stadium in Bridgewater. Though those of us who knew it was coming have a head start on grief, the official announcement on May 21st still had an emotional impact. This link used to show New Jersey as free of EAB, but essentially surrounded by infestations in bordering states. Now NJ has been added to those with EAB. It may have flown in on its own, from NY or Pennsylvania, or it may have been transported in firewood. None have shown up in traps set in Princeton, but the traps are an imperfect test of their presence. Princeton's battle with the beetle will be expensive. The strategy cannot realistically be to win, but to cushion the blow to canopy and pocketbook. Any view more optimistic than that veers into wishful thinking. 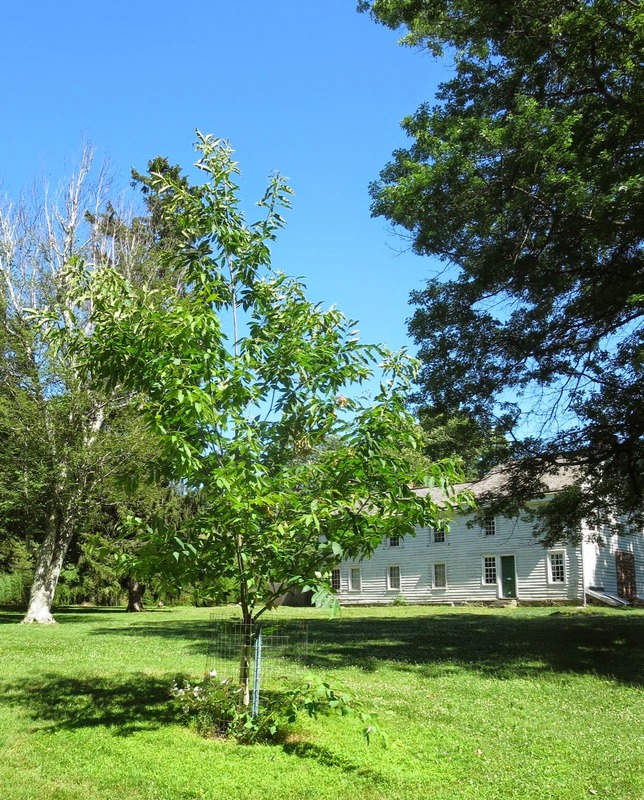 In the twelve years since it was first identified in Michigan, neither white nor green ash has shown resistance to the insect, and no controls are poised to save the day. We may save some of our ash trees with systemic insecticides, at considerable expense, but far more will be lost to a diminutive beetle that no one noticed in Michigan until it had become to entrenched to eradicate. And Princeton has a lot of ash to lose, it being our most numerous tree. 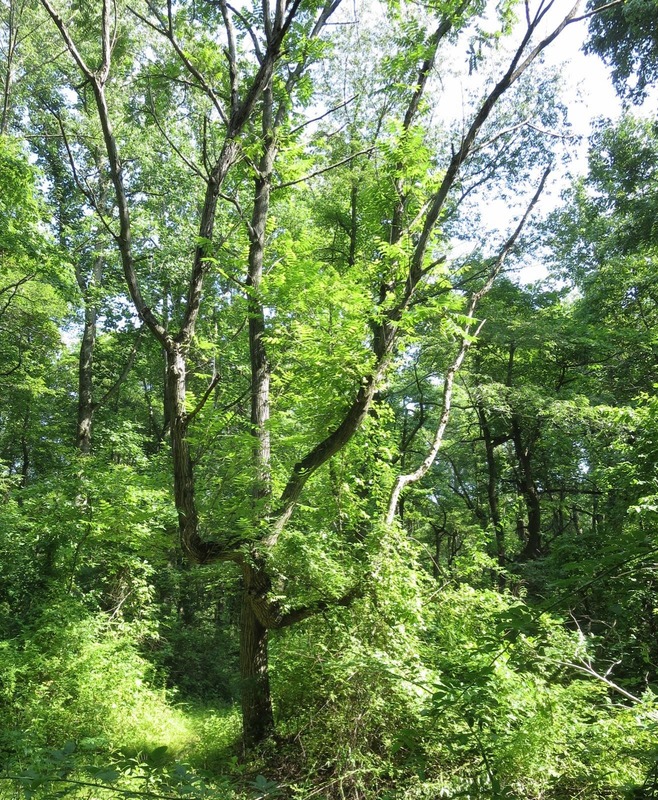 Arborist Bob Wells' recent inventory identified 2200 white and green ash trees along the streets, plus the uncounted thousands in our parks and woodlands. The strategy for dealing with the invasion, which could arrive in Princeton in a year or two, or could already be here but undetected, will likely involve chemical treatment to protect the finest specimens, and beginning to cut down other ash even before they show symptoms. There are chemicals that can be used to save individual trees. As a proactive measure, Princeton University began treating its most valuable ash trees two years ago. Choosing which insecticide to use involves tradeoffs. Imidicloprid is less expensive, but is injected into the soil around it rather than directly into the tree. Because the compound is toxic to pollinators, it should not be injected where flowers are growing beneath the tree. The herbaceous plants will absorb the chemical and transfer it to the pollen in their flowers, where the pollinators will be exposed. Other options can be found in the extensive notes below. Two things are particularly upsetting about the arrival of the emerald ash borer. Of course first and foremost is the loss of a tree species and all the beauty and services it has been providing for free. The other is New Jersey's incredible lack of preparedness. Composting centers are already overwhelmed. Trees make an excellent fuel--one of the few ethical forms of energy we currently have available to us, since wood's carbon comes from the air rather than from underground sources. The technology is available to cleanly run cogeneration plants with wood for fuel. If the state actually is preparing for what one arborist called "ten years of mayhem", it's being done very quietly. Chances are, New Jersey will only start reacting once the devastation begins, even though it had ten years to prepare. The recurring lesson is of the abundant services and beauty nature gives, every day, none of which are entered into our economic calculations, and the increasing vigilance and stewardship required to guard those gifts as global trade increases the pace of change. Below are my collected notes on the coming invasion, including an extensive phone conversation with Donald Eggen, division chief for Forest Pest Management in Pennsylvania. EAB attacks trees as small as 1" in diameter. The insects start at the top of the tree and work down. The Louisville Slugger baseball bats are made out of ash harvested in northern PA. EAB is now moving into that area. Traps for detecting EAB in an area don't work very well. Their odor imitates a stressed tree. EAB doubles each year. If 16% of trees affected, the next year there will be 32, then 64, then all. It can sweep through a town in five years. (sources on web suggest more like ten years--perhaps it takes a few years to get to 16%, and then a couple years to kill those that are last to be attacked). Don't treat if more than 30% in decline. Insect damage can't be repaired. Most ash in decline, even without EAB, due to winter storms, wet weather, all of which, if it's a street tree, brings out root ball problems left over from improper planting. Kill the roots, kill the tree. Options are to treat, to remove, or to remove and replace. Don't delay on treatment. Do most critical trees in first year. Spread the cost out. Treatment: Recommends Tree-age (Emamectin Benzoate), a play on the word "triage". Not available to homeowners, it's restricted use, and must be applied by professionals. It's more expensive than another treatment with various names such as Merit, but has advantages in that it is injected directly into the tree. The injection point is at the base of the tree, where it flares out just above the ground. This is where the sapwood is thickest. The product is made by Arbor Jet, and applicators should undergo training through Arbor Jet. There is reason to believe that it will last longer than two years, possible 4 or more. Merit, as with other similar products whose active ingredient is imidicloprid, is injected into the soil around the tree. If the soil is compacted, the uptake could be slower. Something called Safari is sucked up faster by the tree than Merit, but doesn't last as long (?). Both Merit and Safari protect the leaves well. A product called Xytec has to be applied every year. With Tree-age, treat late May through June. A cloudy day with a little breeze is best. (presumably when a tree is translocating upward most effectively). Ash can be more costly to remove than to treat. If they die, they become brittle very quickly, which makes them more dangerous to work on. Some arborists refuse to go up in the trees if they have become brittle. An increase in accidents has been documented. The trees can also become weak at the roots and topple over at the base. Chicago is treating tens of thousands of ash, at a cost of $1.4 million/year. The plan is on the website. Westchester, PA has a 10 year plan that includes cost. Asian Longhorned Beetle (ALB) in Wooster, MA, big infestation. ALB has gotten into the woods, which is bad because it doesn't kill trees in the woods and therefore is hard to find. Not as good a flyer as EAB, so slower to expand territory. Black walnut disease found in Bucks County, contained apparently. The New York Times ran an article on emerald ash borer, featured in a talk in Princeton by the Times science editor that same day. Here's an article that claims that woodpeckers can play a role in controlling EAB. I'm skeptical. Interestingly, ash continue to sprout in the woodlands in Ann Arbor, and can grow to 6 inch diameter, but the chances of their growing to maturity are slim. Some sources on the web suggest that once EAB passes through and attacks all the trees there are to attack, then ongoing treatment costs for those trees saved will come down somewhat. Update: A short video on a parasitic wasp being introduced in Maryland to help control the EAB. Sounds like it could potentially help in the longterm, but is described as "a drop in the ocean", given the vast numbers of EAB compared to the few parasitic wasps released. All the finest native wetland wildflowers of the DR Canal, Carnegie Lake, Rogers Refuge and Mountain Lakes continue to thrive in that walled-in marvel of serendipity called the PHS Ecolab. The "PHS Ecolab" sounds like a ship, and it is in a way, an ark that survives flooding just fine but whose long term botanical prosperity and diverse portfolio of native species depends on the sweet, cool waters that flow from Princeton's version of Old Faithful--the sump pump that delivers doses of water from the high school basement every fifteen minutes or so, day in, day out. Yes, when the day is done, the property taxes paid, and Princeton's mood turns to romance without finance, many an evening walk begins with "Honey, lets go watch the sun set over the athletic fields, and see what's blooming in the high school wetland." 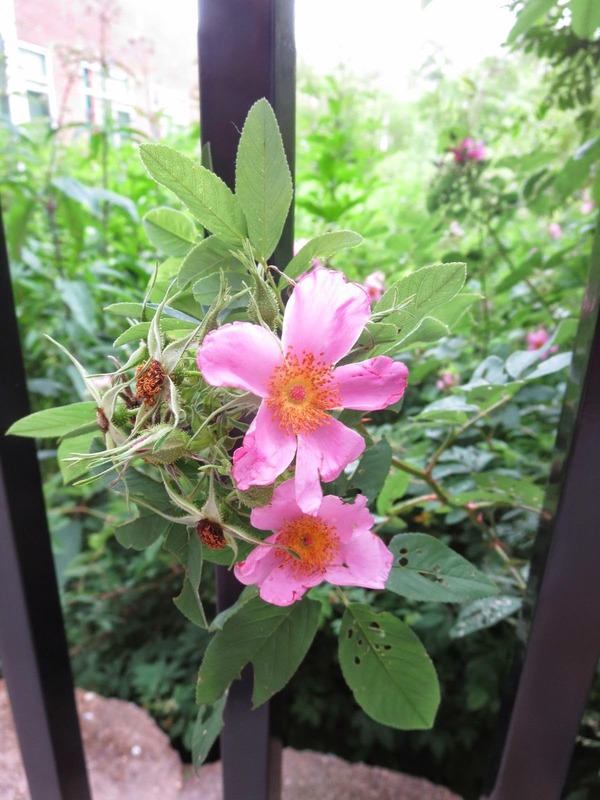 On this particular day, peering through the bars is a swamp rose, with a refreshing fragrance that cuts through the summer heat. Green frogs and crayfish hide amongst the pickerel weed that continue blooming through the summer. The blooms of lizard's tail don't last as long, but have a jazzier look. Impress your sweetheart by offhandedly pointing out that, unlike pickerel weed, Lizard's tail need not be in standing water to thrive. See deeper meanings in the miracles a little basement water can work if allowed to see the light of day. Note, with a knowing nod of the head that suggests great wisdom, that even metaphors for personal growth need tending. As in the story of Noah, there are points along the way where human intervention is necessary, where the natural energy must be steered, lest this highly naturalistic garden tip out of balance. Small interventions, really--countering the imperialistic tendencies of otherwise lovable cattail, pulling out any stiltweed or carpgrass that sneaks in. Maybe undercut the curly dock and plantain if they're getting too numerous on the elevated ground. Pull some of the goldenrod that's leaving no room for the cutleaf coneflower. Or else, don't mention all the mechanics and let it all seem easy and natural. It is easy, except for a few hours a year, because working with nature rather than against it makes life easier in so many ways. This is the story of how serendipity can come along for the ride when you follow your passions. It begins with a tree at Autumn Hill Reservation in eastern Princeton, surrounded by other trees and yet genetically alone. No one would mistake this hunchback for beautiful, with its skewed limbs reaching awkwardly this way and that. 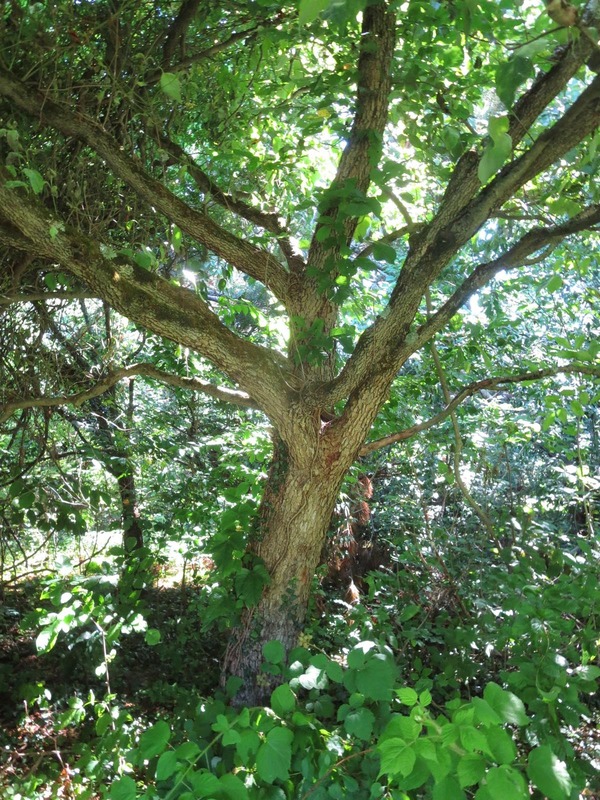 In fact, I'm sure no one noticed it at all, until arborist Bob Wells happened to be walking by one day, looked up and saw that it was no ordinary tree. No ifs, ands, or buts, he thought. That's a butternut. Now, ask most anyone what a butternut is, and they will tell you they have no idea. The latin name Juglans cinerea is even less likely to ring any bells on Nassau Street. It's getting harder to be acquainted with butternuts, because the species has been laid low by a fungus imported some fifty years ago, that left most dead and the rest alone in the woods. Without a mate, they cannot cross-pollinate, which explains why the last time you ate a delicious butternut was, well, never? Bob told me about the tree, perhaps because he knew I'm the kind of guy who cannot abide the thought of the last butternut in the forest. Fortunately, I happened to have another friend, Bill Sachs, who had taken it upon himself five years ago to seek out the last butternuts in Princeton. Bill happened to be doing some consulting for the Textile Research Institute, which is on a beautiful site overlooking Carnegie Lake, with rock bluffs, a ridge of mighty white oaks, and a small stream near which Bill found two mature butternut trees. Two is just enough to make nuts, which he carefully collected, had genetically tested for nativeness, planted and grew. It's a good thing he did what he did when he did it, because those two trees have since fallen, one from wind, the other by accidental cutting. This chain of knowing and caring led to the day earlier this week when I headed into Autumn Hill to plant two young butternuts in the vicinity of the mature one. With me were Sally Curtis and Kurt Tazelaar, the extraordinary trail-tending members of the Friends of Herrontown Wood. It can be hard to find a spot to plant a four foot tree in the forest. Most of the sunlight is already claimed. It's even harder to plant them when you've been so preoccupied with bringing all the necessary tools that you forgot to bring the trees along. I discovered this only after hiking deep into the woods, and had to head back home to get them. Passion and absent mindedness sometimes keep company. Fortunately, there was a hole in the canopy right next to the mature butternut. 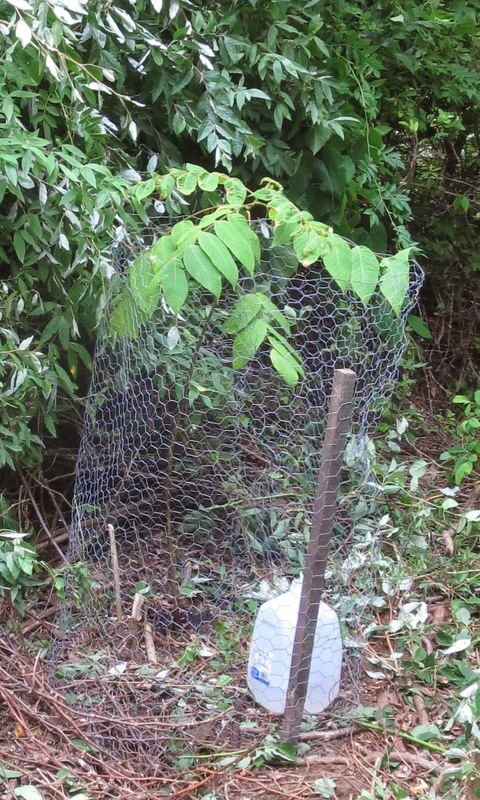 Unfortunately, holes in the canopy promote the growth of a dense layer of invasive shrubs. The perfect spot to plant the trees, I determined, was right in the middle of a formidable patch of 15 foot high autumn olives, honeysuckle bushes, and thorny multiflora rose. At this juncture, Kurt and Sally could understandably have considered mutiny. The potential longterm payoff of butternuts had to be measured against the immediate prospect of doing battle with thorn-laden brush on a hot afternoon. But Kurt and Sally are not easily daunted, so we started hacking away at the wall of invasive shrubs. It turned out that serendipity was on our side. 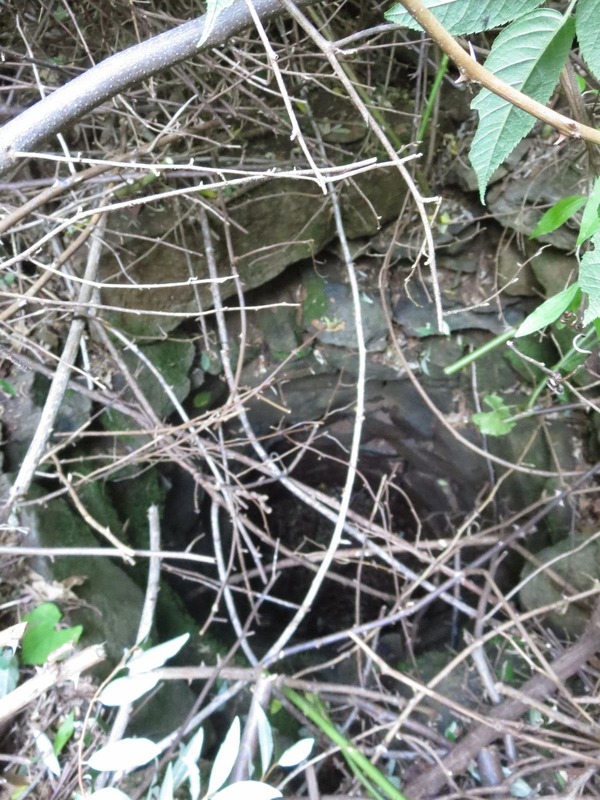 As we lopped and sawed our way deeper into the tangle, I saw what looked like a deep hole in the ground, which turned out to be a hand-dug well, beautifully lined with field stones. and beyond that was a small dug-out area that looked like a root cellar. At this point, we had pretty much forgotten about the butternut trees and had assumed the role of explorers having stumbled upon Princeton's version of Mayan ruins long lost in the jungle. Now, what are the chances that the old homestead would have been in the one spot we decided to clear? It's a variation on one fairy tale or another, with the butternut species playing the damsel in need of rescue, left to wait while the matchmakers check out the really cool castle. We did get around to planting the two young butternuts, as evening approached. Later, I checked a map made long ago by Jac Weller, who ran the last microfarm in the Herrontown neighborhood. (His farm was later turned into Smoyer Park.) The map shows where all the small homesteads were, back in the 1870s. The closest to our discovery appears to be either the Scudder or Goeran farmstead. There's also the possibility that the butternut or its predecessors were planted by the farmer a century or so ago, making the proximity of the farmstead less than accidental. This NRCS website says it was a common practice, as does this one. Either way, it's actually very convenient to find a homestead nearby when you plant trees deep in the forest. The well, if it still has water, will come in handy if we need to water the trees. "The nut in a butternut is distinctly oblong or football-shaped and also hairy with a sticky texture. When in doubt, snag a low hanging branch if there is one and check a leaf or two and twig. The rachis, leaves and terminal of a butternut tend to be hairy or fuzzy (pubescent); in black walnut, smooth. If you slit the twig with a pocket knife, you will find a chambered pith. In butternut it is chocolate-brown in color; in black walnut, buff or pink. There are other distinguishing characteristics, but these are the ones I depend on in the summer." The lovely, spreading American elm at the corner of Harrison St and Hamilton Ave. has finally succumbed to Dutch elm disease. Not that many people will have noticed. Thousands of cars pass through this busy intersection every day, their drivers seeing only a blur of green. And there are many trees in the neighborhood that even those of us who walk will find conspicuous only in their absence, when we encounter a stump and a large gap in the canopy and wonder what was there. This elm is one of the trees I noticed, so well matched to the space it was given, its long limbs spreading the gift of shade. And though I grieve its passing, it has lived a longer life than any American elm could be expected to live. Coming to New Jersey from Michigan and North Carolina, I had largely conceded the elm to fringe status, its glorious, towering vase-like form living only in memory. But in Princeton, American elms are more than a memory. They may sometimes be downed by the disease, but are not out. Nine years ago, the famous elm in Princeton Cemetery finally succumbed, but not before making the front page of the New York Times and spawning a generation of disease resistant elms, some of which were chosen to grace Pennsylvania Avenue in Washington, D.C.
By chance, I happened to be walking by the elm at Harrison and Hamilton recently when a man was standing beneath it with a clipboard. It was Arborist Joe Christopher, who oversees treecare at the housing development there. He said the tree has to come down, and recalled stories of how, when Dutch Elm disease swept across America, chain saws could be heard all day. We agreed that Princeton is on the cusp of a similar era. Christopher predicts "a decade of mayhem", beginning when the emerald ash borer sweeps into Princeton as it has all over the midwest and now in the east, killing any ash tree that hasn't been inoculated against it. Over the years, Princetonians have rallied to protect this or that beloved tree from being taken down by developers. But there's a much bigger battle going on, one that has to be fought by government agencies, regulators and inspectors, to protect America from the radical change that comes when a pest like emerald ash borer is introduced. Other tree species are also threatened. 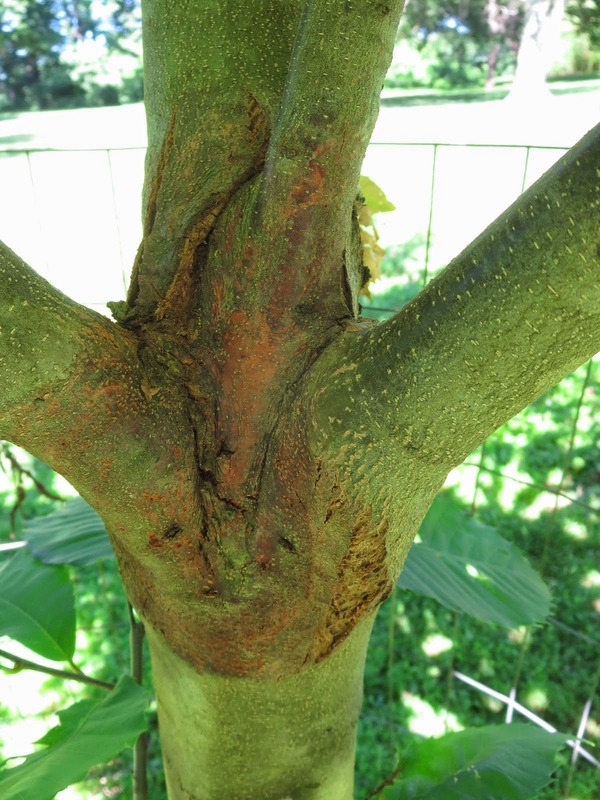 Thousand cankers disease, a major threat to black walnuts, was found recently in Bucks County. The Asian longhorned beetle, another accidentally import that threatens many hardwood species, particularly maples, has been found again on Long Island, and is proving hard to eradicate in Massachusetts. We're in for a rough patch with our trees, and all the myriad kinds of insects and other wildlife that depend upon them, which is why the loss of our elm at the corner is by comparison a positive story. It lived a good and fairly long life, despite considerable odds. Efforts are underway in town to bring back the American chestnut and the butternut. Ash may still persist as small individuals in the woods after the emerald ash borer sweeps through. But the beauty and diversity that was once ours for free is now having to be worked at. What we're losing, species by species, is that easy grandeur that has long defined America. It looked like nature was going to steal the show on July 2nd. The sky that evening was supposed to be reserved for Princeton's fireworks display, but nature didn't get the memo and showed up for open-stage night with a very impressive light show and sound effects. Nature proved once again it can be a brilliant performer, but remains stubbornly improvisational, refusing to stick to a schedule, or observe our own. Fireworks are more dependable, and can work hard to impress with light and din, but we were reminded that there's nothing like a good thunderclap at close range to send a jolt of awe and trepidation through the nervous system. It's a sustainable form of fireworks--no mined chemicals needed, no fossil fuels. There's some danger involved, but usually it leaves in its wake nothing more than a pleasing aroma of ionized air to sooth our rattled nerves. And, of course, a bit of rain, which proved handy for upstream Princeton, nicely cleaning off the streets and quenching the thirst of gardens. Downstream Princeton did not fare as well. Down where Meadowbrook Lane meets Braeburn Drive, the flooding was as flashy as the lightshow. This is "the flood house", at 59 Meadowbrook, the rental that town council recently voted to buy (mostly with federal funds) and tear down. You can see that the house (its patio is on the right in the photo) was built a wee bit too close to Harry's Brook. Whatever regulatory lapse long ago allowed the construction of the house at that location has triggered over the years a flood of FEMA money flowing out of federal coffers to deal with the resultant mess. More on that at this link. On this 4th of July, we can celebrate the sorts of regulations that make it less likely that the public sector will get called in to clean up problems created by private entities. While the pulse of stormwater continued on its way to Carnegie Lake, upstream Princeton's fireworks rose improbably in the light mist, delayed but not deterred, their detonations ringing through the neighborhoods and drawing the more adventurous down to the athletic fields for a view. In a populace so saturated with highly visual electronic stimuli, fireworks don't hold the same allure they once did. I've heard tales of the '70s, when Princetonians are said to have gathered in large numbers on the green, bringing lavish table settings, dining while serenaded by symphonies, all as prelude to the fireworks at nightfall. Some of this may still endure. Before the storm hit, strains of Souza and Gustav Holtz drifted into my backyard garden from the direction of the fields. Still, something's changed. In our 21st century version, even among those of us who ventured out, many were experiencing the fireworks as much through their iPhones and iPads as by looking directly up at the fireworks themselves. As someone highly empathic towards plants, I woke up today sensing that something was amiss. Somewhere, a native pawpaw was being shaded out by a Norway maple. Now, I like Norway, and I like maples, but a Norway maple tends to sprout unasked along the fencelines of our fair town, then cast its over-the-top stifling shade upon all hapless plantlife that, through no fault of its own, happens to be growing nearby. Many plants suffer in silence. In fact, just about all of them do, if they happen to be suffering, and it's up to those of us bestowed with special powers, caring, and knowledge to act for their welfare. The situation is all the more dire when a pawpaw is not getting enough light to make flowers and bear that delicious tropical-tasting fruit. and put some mettle to the pedal. Useful tip: Riding while holding something in one hand is probably not a good idea, but if your hat looks alot like Lancelot's, or at least you're holding something that looks alot like a lance, you'll find that car drivers suddenly start showing some respect. I arrived on the scene without a second to lose, although if I'd waited a week it probably wouldn't have made much difference. Just as I suspected, a friend's pawpaw was being heavily shaded by a Norway maple. The pawpaw's endearingly obovate leaves were literally, or at least laterally, crying out for sunshine. Elsewhere in the yard, its faithful companion pawpaw, long liberated, kissed by sunshine and now thirty feet high, had borne most nobly a thousand blooms this spring just past, yet for lack of a companion to cross--pollinate with, it had not one fruit to show for it. Clearly, action was needed so that this fine upstanding couple might share their pollen and bear most heavily many a pawpaw in years to come. A few deft strokes of the pawpaw liberation saw were all that was needed to, well, at least get the lowest maple branch out of the way. You can see a little gap in the canopy where the sun can shine through. A higher branch will require even more chivalry, and a good ladder. Though logistics prevented a fully accomplished mission, the intervention may still bear fruit.